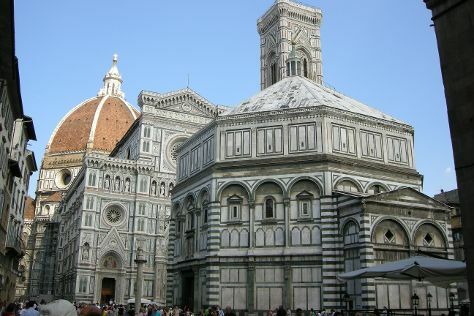 Start off your visit on the 20th (Sat): admire the masterpieces at Pitti Palace, take in the spiritual surroundings of Cathedral of Santa Maria del Fiore, and then get to know the fascinating history of Centro Storico. Here are some ideas for day two: admire the striking features of Loggia dei Lanzi, then admire the masterpieces at Uffizi Galleries, then don't miss a visit to Piazzale Michelangelo, and finally ride a horse along Maneggio Guelfi Neri - Passeggiate a cavallo nel chianti. Venice to Florence is an approximately 2.5-hour train ride. You can also drive; or take a bus. In April, plan for daily highs up to 22°C, and evening lows to 11°C. Cap off your sightseeing on the 22nd (Mon) early enough to go by car to Siena. On the 22nd (Mon), don't miss a visit to Centro Storico di Siena, take in the architecture and atmosphere at Siena Cathedral, then contemplate in the serene atmosphere at San Francesco, and finally contemplate the long history of Casa di Santa Caterina. To find out how to plan a trip to Siena, use our trip itinerary maker. Getting from Florence to Siena by car takes about an hour. Other options: take a bus; or take a train. In April, daily temperatures in Siena can reach 23°C, while at night they dip to 9°C. Finish your sightseeing early on the 23rd (Tue) to allow enough time to drive to Orvieto. 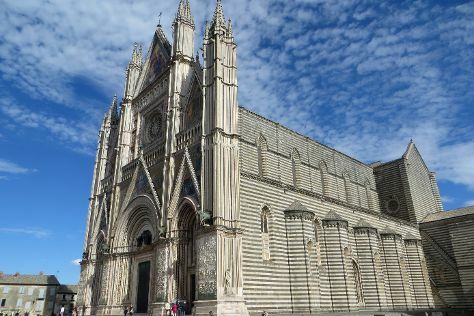 On the 23rd (Tue), contemplate the long history of Duomo di Orvieto, contemplate in the serene atmosphere at Cappella del Corporale, explore the fascinating underground world of Orvieto Caves, then see the interesting displays at Etruscan Museum "Claudio Faina", then explore the fascinating underground world of Pozzo della Cava, and finally pause for some serene contemplation at Chiesa San Giovenale. For other places to visit, reviews, ratings, and other tourist information, read our Orvieto trip builder app . Traveling by car from Siena to Orvieto takes 1.5 hours. Alternatively, you can take a train; or do a combination of bus and train. April in Orvieto sees daily highs of 21°C and lows of 9°C at night. Cap off your sightseeing on the 24th (Wed) early enough to catch the train to Rome. Start off your visit on the 24th (Wed): look for all kinds of wild species at Ente Parco Naturale Regionale dei Monti Lucretili and then tour the pleasant surroundings at Lagustelli di Percile. On your second day here, admire the striking features of Pantheon, identify plant and animal life at Riserva Naturale Monte Catillo, then take in the architecture and atmosphere at St. Clement Basilica, and finally contemplate the long history of Palatine Hill. For photos, more things to do, traveler tips, and more tourist information, you can read our Rome road trip app . Take a train from Orvieto to Rome in an hour. Alternatively, you can drive; or take a bus. Expect a daytime high around 24°C in April, and nighttime lows around 11°C. Finish your sightseeing early on the 26th (Fri) to allow enough time to drive to Assisi. Start off your visit on the 26th (Fri): contemplate in the serene atmosphere at Basilica di Santa Chiara, pause for some serene contemplation at Basilica inferiore di San Francesco d'Assisi, explore the ancient world of Roman Forum and Archaeological Museum, take in the spiritual surroundings of Eremo delle Carceri, then see the interesting displays at Museo della Porziuncola, and finally contemplate in the serene atmosphere at Basilica di Santa Maria degli Angeli - Porziuncola. To see traveler tips, reviews, ratings, and tourist information, you can read our Assisi itinerary maker site . You can drive from Rome to Assisi in 2.5 hours. Other options are to take a train; or take a bus. Expect a daytime high around 22°C in April, and nighttime lows around 8°C. 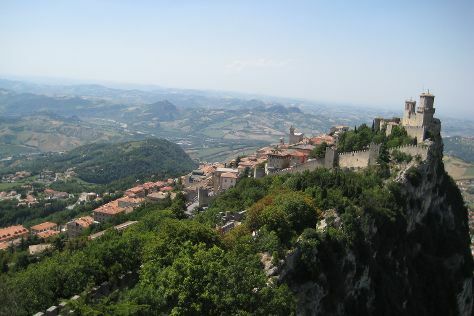 Cap off your sightseeing on the 27th (Sat) early enough to go by car to City of San Marino. The capital of one of the world's smallest and oldest republics, the hillside city of San Marino boasts a World Heritage-listed old town that's known for its winding cobblestone streets and sweeping views of the surrounding countryside. Kick off your visit on the 27th (Sat): steep yourself in history at Cesta Tower, take your sightseeing to a higher altitude at Mount Titan, contemplate the long history of Piazza della Liberta, see the interesting displays at Museum of Torture, then immerse yourself in nature at Orti Borghesi San Marino, and finally explore the historical opulence of Guaita. For traveler tips, more things to do, where to stay, and tourist information, read our City of San Marino trip planner . Drive from Assisi to City of San Marino in 2.5 hours. Alternatively, you can do a combination of train and bus; or take a bus. Traveling from Assisi in April, expect nights in City of San Marino to be about the same, around 10°C, while days are little chillier, around 19°C. Wrap up your sightseeing on the 28th (Sun) to allow time to drive to Rimini. A popular resort town on Italy's east coast, Rimini has been an inhabited settlement since prehistoric times. 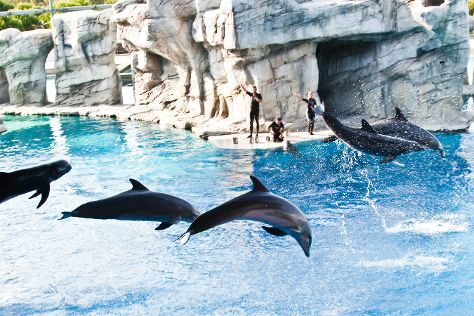 On the 28th (Sun), get up close and personal with brilliant marine life at Oltremare, then enjoy the sand and surf at Beach Egisto 38, and then get to know the fascinating history of Borgo San Giuliano. To see where to stay, more things to do, traveler tips, and more tourist information, use the Rimini online trip itinerary builder . Rimini is very close to City of San Marino. Expect a daytime high around 19°C in April, and nighttime lows around 10°C. Finish your sightseeing early on the 29th (Mon) so you can drive to Ravenna. Famous for its wealth of original mosaics, Ravenna is a hub of artistic and cultural heritage. Kick off your visit on the 29th (Mon): take in the architecture and atmosphere at Basilica di S. Giovanni Evangelista, admire nature's wide array of creatures at Safari Ravenna, take in the spiritual surroundings of Basilica di Sant'Apollinare in Classe, steep yourself in history at Basilica di Sant'Apollinare Nuovo, then take in the spiritual surroundings of Battistero Neoniano (Battistero degli Ortodossi), and finally contemplate in the serene atmosphere at Basilica San Vitale. To see traveler tips, reviews, where to stay, and other tourist information, you can read our Ravenna travel route builder site . Getting from Rimini to Ravenna by car takes about an hour. Other options: take a train; or take a bus. In April in Ravenna, expect temperatures between 21°C during the day and 9°C at night. Finish up your sightseeing early on the 30th (Tue) so you can go by car to Bologna. Kick off your visit on the 30th (Tue): contemplate the long history of Piazza Maggiore, take in the architecture and atmosphere at Chiesa di Santa Maria della Vita, contemplate the long history of Basilica di San Domenico, pause for some serene contemplation at Basilica - Santuario di Santo Stefano, then steep yourself in history at Torre Prendiparte, and finally pause for some serene contemplation at Cattedrale di San Pietro. To find photos, reviews, where to stay, and other tourist information, read Bologna road trip website . Drive from Ravenna to Bologna in an hour. Alternatively, you can take a train. Expect a daytime high around 22°C in April, and nighttime lows around 10°C. Finish your sightseeing early on the 1st (Wed) so you can take a train to Verona. Kick off your visit on the 1st (Wed): explore the historical opulence of Museo di Castelvecchio, take in the spiritual surroundings of Basilica di San Zeno Maggiore, browse the eclectic array of goods at Piazza delle Erbe, then don't miss a visit to Torre dei Lamberti, then pause for some serene contemplation at Chiesa di San Fermo, and finally experience the emotional art of opera at Arena di Verona. To see more things to do, maps, ratings, and tourist information, read Verona route planner . Traveling by train from Bologna to Verona takes an hour. Alternatively, you can drive; or take a bus. In May, plan for daily highs up to 27°C, and evening lows to 13°C. Wrap up your sightseeing on the 2nd (Thu) to allow time to drive to Sirmione. Sirmione is a comune in the province of Brescia, in Lombardy (northern Italy). Kick off your visit on the 2nd (Thu): pause for some serene contemplation at Chiesa di San Pietro in Mavino, explore the ancient world of Grotte di Catullo, then step into the grandiose world of Rocca Scaligera di Sirmione, then learn about all things military at Scaliger Castle, and finally pause for some serene contemplation at Chiesetta di S. Anna. To see maps, where to stay, photos, and more tourist information, you can read our Sirmione online tour planner . Sirmione is just a short distance from Verona. In May in Sirmione, expect temperatures between 26°C during the day and 14°C at night. Finish your sightseeing early on the 3rd (Fri) to allow enough time to drive to Moena. Moena is a comune in Trentino in the northern Italian region Trentino-Alto Adige/Südtirol, located about 60km northeast of Trento. On the 3rd (Fri), pause for some serene contemplation at Chiesa di S. Giovanni, pause for some serene contemplation at Santa Giuliana, explore the different monuments and memorials at Cimitero Militare Austro-Ungarico, then get outside with Karersee, and finally take a stroll through Antico Rione Di Moena. To see where to stay, ratings, maps, and tourist information, use the Moena road trip planner . Traveling by car from Sirmione to Moena takes 2.5 hours. Alternatively, you can take a train; or take a bus. In May, daily temperatures in Moena can reach 28°C, while at night they dip to 13°C. Finish your sightseeing early on the 4th (Sat) so you can drive to Venice. Start off your visit on the 4th (Sat): hunt for treasures at Mercati di Rialto, take a stroll through Cannaregio, then explore the galleries of Peggy Guggenheim Collection, and finally make a trip to Basilica di San Marco. 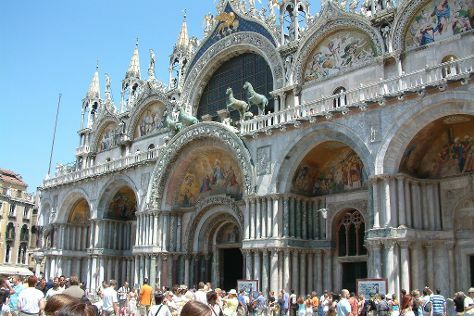 Keep things going the next day: appreciate the extensive heritage of St. Mark's Square, then admire the striking features of Doge's Palace, then take in the spiritual surroundings of Basilica Santa Maria Gloriosa dei Frari, and finally contemplate the waterfront views at Canal Grande. To see other places to visit, where to stay, more things to do, and tourist information, use the Venice visit planning site . Traveling by car from Moena to Venice takes 2.5 hours. Alternatively, you can take a train; or take a bus. In May, daytime highs in Venice are 26°C, while nighttime lows are 15°C. Wrap up your sightseeing by early afternoon on the 6th (Mon) to allow time for travel back home.